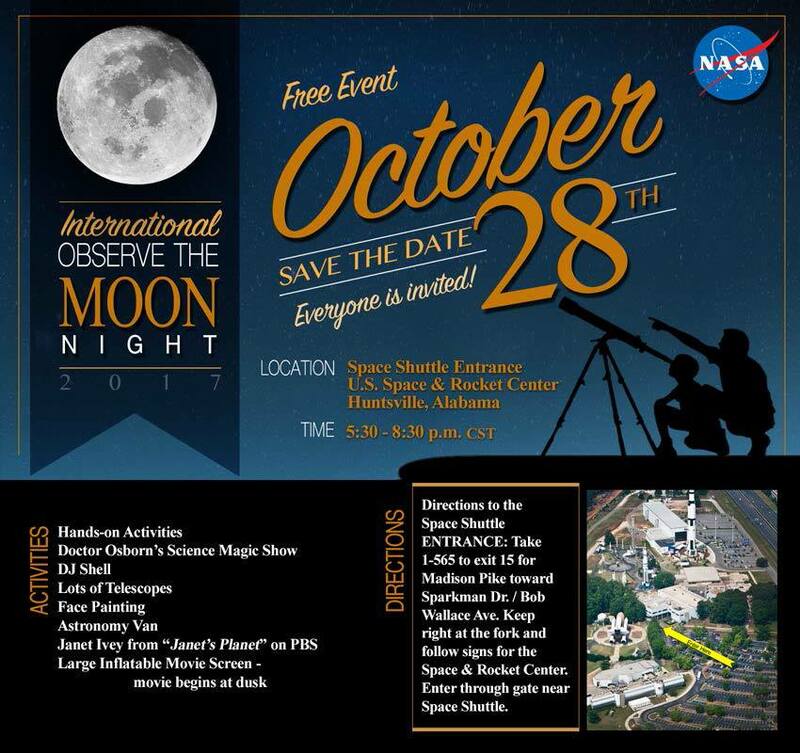 NASA Marshall Space Flight Center's Planetary Missions Program Office is hosting the 8th Annual International Observe the Moon Night Event on October 28, 2017 from 5:30-8:30 p.m. at the U.S. Space & Rocket Center in Huntsville, AL. The event will be held in the Space Shuttle area and you may enter through a gate in front of the Space Shuttle. See the map on the flyer for more information. You don’t want to miss this family fun event that is bigger than ever. The event is FREE and everyone is invited. We will have hands-on activities, airbrush tattoos, special speakers, large movie screen, science magician, photo booth, DJ Shell, interactive robot, Janet from Janet’s Planets (PBS) and lots of telescopes. After enjoying all of the fun activities, find a spot to watch “Scooby-Doo Moon Monster Madness" on the large inflatable movie screen. The movie will begin a dusk. There is a calendar event on Facebook. Please invite others on the event site https://www.facebook.com/events/1857391524590233. Call 256-724-1351 if you have any questions. Thanks for your continued support!!! ASRC Team | Customer-Focused. Operationally Excellent.